I think it is safe to say that most of us love the feeling of the sun on our skin, especially if we’re sitting on a tropical beach somewhere with a cocktail in our hand. Unfortunately though, the sun is one of the biggest culprits when it comes to things that can damage and prematurely age our skin. Anyone who has ever suffered from an extreme dose of sunburn can surely attest to this! Bearing this in mind, it is important for women of all ages to look after their skin by using the best sunscreen they can, especially women over 50. Many people think that the damage is done when you are young and when you are older it is too late. Well while it is true that a lot of damage is done when you are young that affects you when you’re older, the sun can still do further damage your skin when you are older. 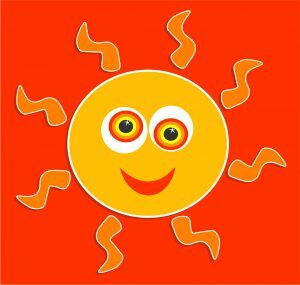 Many of us have sun damage from our younger years before we were even aware what the solar rays were doing to our skin, but why would you want to make it any worse! In order to still enjoy the sun and minimize any damage to our skin it is important for us older women over 50 to find and use the best sunscreen we can to protect our skin with and ideally avoid any unpleasant side effects like greasy skin and breakouts too. Depending on where you live, the effects of the sun are different. 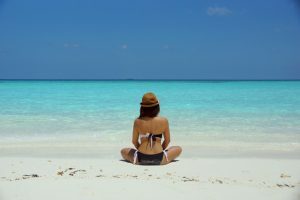 The sun’s rays can be stronger in one location than in another, but whether you’re in Hawaii or down under in Australia or even in Alaska the Ultra Violet radiation still comes through and can both hurt and damage your skin, resulting in sunburn. I think it’s safe to say we all know that sunburn is not a situation we want to be in. Excessive exposure to the sun’s UV rays causes our skin to dry out and prematurely wrinkle. In addition to this, it can leave us with sunspots and in the worst case, melanoma and other skin cancers. Even if we do not get to the point of sunburn, frequent repeated exposure will make us look further aged than we actually are and I for one am not interested in having a face that looks like an expensive leather handbag! Despite the damage that excessive exposure to the sun can do to our skin, we cannot really avoid the sun and as a matter of fact it is actually important for us to have enough sunlight in our lives. We need a certain amount of sunlight to get our Vitamin D and also to stop us from becoming depressed. We can also get Vitamin D through certain foods and dietary supplements but it is difficult. Also, not all of us will be susceptible to SAD but for those that are it can be a tough time. So, what do we do? Obviously the best way to avoid sun damage to your skin is to stay out of the sun. But for most of us, this is not a realistic nor a pleasant option. So if we want to have our cake and eat it too then we have to look at ways to protect our skin while we are in the sun. The two main ways to do this are to cover our skin with clothing and to wear sunscreen. Appropriate clothing made of materials that is rated to stop the uv rays getting through is good, but it is often not comfortable (nor fashionable!) to cover every inch of your body with clothing. If you are going for a swim in the Caribbean then you are certainly not going to be covered and will have to rely on sunscreen. A good sunscreen is one of the best preventative measures we can take to care for our skin and choosing the best one for our personal situation can make a world of difference to the health and comfort of our skin. If you are a woman over 50 you may not think that sunscreen is important and that spf moisturizer is enough. Well in some circumstances this is true but if you want to really protect yourself properly then using the best sunscreen you can find is key. Often times we only really have to protect ourselves from intermittent exposure, small periods where we might get a little bit of sun such as walking from the parking lot into a store, for example. At times like this I prefer to just use a good moisturizer that contains at least spf 30. My favorite for this at the moment is the Paula’s Choice Skin Recovery Daily Moisturizing Lotion. I find it to be a good consistency as I put it on so that it is not too thin and watery to put on but not so thick that it takes ages to absorb. Paula’s Choice products are ‘fragrance free’ but I find this to have a pleasant cucumber smell, however it is very subtle and I only notice it as I have a very keen sense of smell. It is probably not the best moisturizer you can get nor the best sunblock you cab get but in my opinion it is very good in both these areas and certainly the best 2 in 1. If you are going to be spending a bit more time in the sun or exposing a lot of your body such as swimming or attending a garden lunch in a singlet then you need to use a product that offers more protection. For women over 50 this is very important. 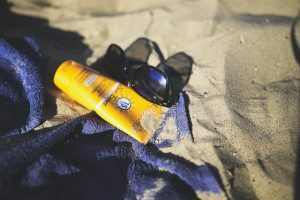 There are so many options out there to choose and it can be a little overwhelming so I will share my experience in terms of what I think are the best sunscreens for different skin types and also the best sunblock to use if you are going to be in the water. Women over 50 with dry skin can use most sunscreens because sunblock lotion is not a product that dries your skin out too badly. There are some out there there are more hydrating than others though and it is best ot use one of these. My pick for older women with dry skin is the Daily Rehydrating Sunscreen by Andre Lorent. It is only spf 30 but so good for your skin I would much rather reapply this than use any other spf 50 or 70. It does a great job at hydrating the skin, you know when you can actually feel your skin become a little softer? Well this sunscreen is just like that. The only drawback for me is that it does not go on perfectly clear, you can see a slight film but it does fade in time so overall I think it’s great. It has lots of really good reviews on Amazon too. Is there anything worse than putting a greasy sunscreen on oily skin? Maybe if you added sand to the mix it could be worse, but I think you know what I mean. Oily skin and sunblock are generally a bad combination but there are a few out there that are particularly good for oily skin, and one of them is the La Roche-Posay Anthelios Dry Touch Sunscreen. It’s light, and goes on smoothly. I dries down to a nice matte finish and is really good for putting makeup over. For an spf 60 sunblock that protects oily older skin really well without making it greasy, this is a winner. It has a very minimal scent which is not at all offensive. For women over 50 with oily skin there are not many sunscreens to choose from and in my opinion this one is the best you can get. It is not cheap but it is not that expensive either and to protect your skin without making it any oilier there is no question that it is worth it. Protecting sensitive skin from the sun is a delicate art, especially for older women over 50. It can be difficult to find a product that will not irritate the skin on your face or even cause break outs. Neutrogena have been creating products for sensitive skin for a long time and the Neutrogena Clear Face Sunblock Lotion is a fine example of this. It has a nice matte finish and there is no residue or greasiness after application. I had a few concerns about how it would affect the skin on my face with it being a chemical sunscreen but whatever is in it is very gentle and does not seem to irritate the skin at all. If you are going to be swimming then you have a few more things to think about other than just protecting your face without irritating or making it dry or oily. You also have to make sure you apply a sunblock lotion that will stay on when you are swimming and most likely you will have to protect more of your body than just your face too. You may not be wearing a string bikini but it is hard to find a swimsuit that doesn’t expose at least a little bit of skin. Also, it is very important to regularly reapply if you are in the sun for an extended period, like if you are spending the day at the beach. The hardest thing about reapplying is putting the sunscreen on wet skin, or getting your skin dry enough to put the suncream on without also getting sand on your skin. The answer here is Neutrogena Wet Skin Sunblock Spray. This is another great product from Neutrogena that is gentle on skin and does a really good job of protecting from the sun. The best thing about it is how you can apply it to wet skin and it still goes on perfectly. It comes in a spray bottle too so you don’t even need to get it on your hands which is great. I’m not sure what the witchcraft is that makes it do this but it works amazingly, try it for yourself to see. Thank you for reading through my thoughts on The Best Sunscreens for Women Over 50. I hope you got something out of it. If you have anything to add I would love to hear from you either through my Facebook,Twitter or Google + pages, or also please feel free to leave a comment below. Thanks again for reading and have a great day! You are right. Too much sun actually does make people look older. In china people who work in the fields gets exposed to the sun all the time. Forty year old people look like they are sixty years old. Sun screen is definitely important because it does damage to DNA causing cancer as a result. I will check out your recommendations. Thank you. Thanks for your input Blame! Thanks for the positive feedback Bob!